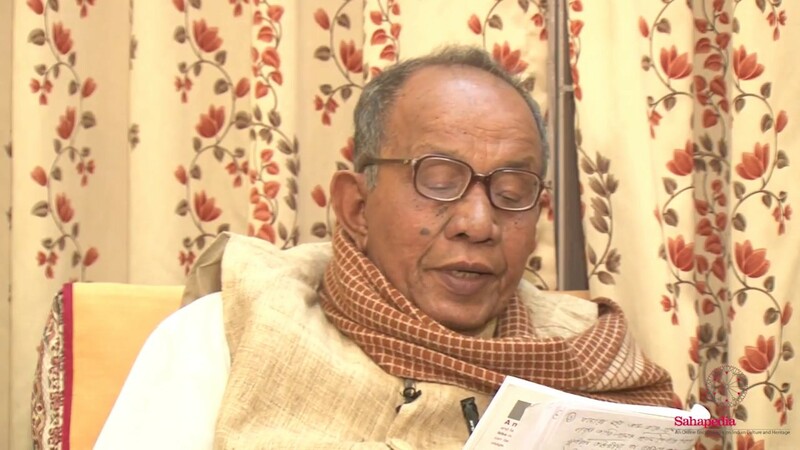 Dr Nabin Chandra Sharma is a septuagenarian scholar and a renowned folklorist of the state of Assam. In this audio-visual discussion the retired Head of Department, Folklore Research, Gauhati University highlights the various aspects of the Bhari Gan folk art form. He initiates the discussion by describing the connotations of the term ‘Bhari Gan’. He further goes on to shed light on how the term ‘Bhari’ carries the meaning ‘heavy’ and how it is associated with the Assamese term for ‘acting’. Dr Sharma also describes the similarities and differences between Bhari Gan and various other theatrical art forms found in the region like Khulia-bhaoriya, Mare Gan, Padda Puranar Gan and others. While comparing the various art forms with Bhari Gan he also describes certain aspects like musical instruments, masks, style of presentation of both Bhari Gan and these other art forms.